Sheldon Adelson, right, talks with Secretary of State, Rex Tillerson, before a speech by President Donald Trump at the Israel Museum in Jerusalem. Adelson has proposed paying for at least part of the new U.S. embassy in Jerusalem, four U.S. officials told The Associated Press, and the Trump administration is considering the offer. Lawyers at the State Department are looking into the legality of the highly unconventional proposal to cover part or all of the embassy’s costs through private donations, the administration officials said. WASHINGTON (AP) — The Trump administration is considering an offer from Republican mega-donor Sheldon Adelson to pay for at least part of a new U.S. embassy in Jerusalem, four U.S. officials told The Associated Press. Lawyers at the State Department are looking into the legality of accepting private donations to cover some or all of the embassy costs, said the officials, who weren't authorized to discuss the issue publicly and demanded anonymity. The discussions are occurring as the administration plans a ribbon-cutting for a scaled-down, temporary embassy that will open in May — more than a year ahead of schedule. Under any circumstance, letting private citizens cover the costs of an official government building would mark a significant departure from historical practice. 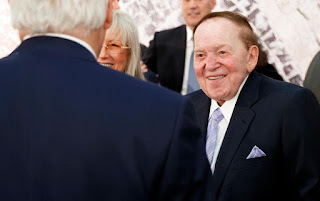 In the Jerusalem case, it would add yet another layer of controversy to Trump's politically charged decision to move the embassy, given Adelson's longstanding affiliation with right-wing Israeli politics. The new embassy cleared a final bureaucratic hurdle this week when Secretary of State Rex Tillerson signed off on the security plan for moving the embassy from Tel Aviv to the holy city. In a letter being sent Friday to Congress, the State Department said the interim facility's inauguration will coincide with the 70th anniversary of Israel's independence on May 14. "It's the right thing to do," Trump said Friday of his decision to move the embassy. Adelson's unconventional offer was made around the time Trump announced in December he would move the embassy to the disputed city of Jerusalem. It would address the president's stated distaste for shelling out eye-popping sums for overseas diplomatic facilities. Although Trump has promoted the Jerusalem move as fulfilling a key campaign promise, he also was outspoken last month in blasting the $1 billion price tag for a new embassy in London. How quickly to move the embassy has been a source of intense debate within Trump's administration, officials said. Tillerson, who opposed moving the embassy in the first place, advocated a go-slow approach and said it could take years. But Ambassador David Friedman, who lobbied Trump to recognize Jerusalem as Israel's capital, has pushed to move it sooner. To enable a May opening, the administration settled on a phased approach to building out the embassy at an existing U.S. facility in Jerusalem's Arnona neighborhood that currently handles consular affairs like passports and visas. Initially, the U.S. will merely retrofit a small suite of offices there to accommodate Friedman and one or two top aides such as his chief of staff. The rest of the staff will remain at first in America's current facility in Tel Aviv. Over time, the Arnona facility will be expanded accommodate a regular contingent of embassy personnel by the end of 2019, officials said. Ultimately, the embassy will likely expand into an adjacent property that currently houses a home for senior citizens but is set to come under U.S. control in the next few years. Retrofitting just a few offices can be accomplished at minimal cost. But expanding into a full-fledged complex housing the bulk of America's diplomatic staff in Israel would easily cost more than $500 million dollars, officials familiar with the process said. Particularly pricey are the strict security requirements for embassies that are written into U.S. law. It's unclear how much of the cost Adelson might be willing to cover. The White House declined to comment. An Adelson spokesman didn't respond to multiple requests for comment. The State Department said it had "nothing to announce" and "no confirmation or details about this hypothetical proposal." Undersecretary of State Steve Goldstein added that there had been no "formal talks" about funding with private citizens. It's not clear if there is any precedent, nor whether government lawyers would give the green light to accept Adelson's or anyone else's donations for the embassy. Kathy Bethany, the former cost management director for the State Department's Bureau of Overseas Building Operations, said she couldn't recall the U.S. government ever accepting donations to build embassies during her tenure, which ended in 2014. "I don't know how well that would work," Bethany said. "Would we be beholden to putting their name on the building? I've never heard of that." There are several ways, in theory, that it could work. Citizens could cut a general check to the U.S. Treasury and unofficially "earmark" their dollars as being intended to offset the embassy's cost. The State Department's Foreign Affairs Manual also lays out a formal process for accepting gifts, including real estate, requiring a rigorous review to ensure the gift "would not give the appearance of a conflict of interest." Allowing donations from Adelson or others would come with significant political risk for Trump. The president already faces major criticism from Palestinians and others who say his decision to move the embassy to Jerusalem — also claimed by the Palestinians for the capital of their future state — tipped the scales unfairly in Israel's favor. Mort Klein, president of the pro-Israel group Zionist Organization of America and a close associate of Adelson, said accepting donations would be ill-advised. Klein said he knew Adelson was "deeply interested" in seeing the embassy relocate to Jerusalem but didn't know whether the casino mogul had offered to help pay for it himself. Associated Press writers Ian Deitch in Jerusalem and Darlene Superville in Washington contributed to this report.